A honest comparison between Brother SE400 and Singer 9960. The choice depends on whether you love embroidery or not. 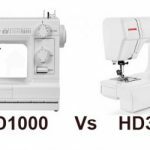 SE400 and 9960 are two popular sewing machines from the respective brands. 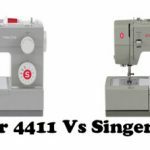 There are two things common to both Brother SE400 and Singer 9960, versatility and quality. In terms of quality and performance, there are not many machines to surpass these two (from both the manufacturers). These two have been selling like hot cakes in U.S, which on itself is a testimony to their quality. In the past Singer 9960 was more expensive than Brother SE400, but now the price seems to have settled in the same range. 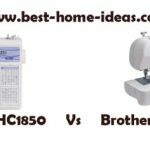 The two being the best sewing machines from the respective manufacturers and also the fact that both fall in the same price category makes the comparison very interesting. Let us see which one offers more value for the money spent. Firstly, we will be taking about the differences and then we will move on to the features that are common on both the machines. Basic Functioning : The basic functioning itself is very different. 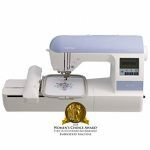 Brother SE400 is a sewing and embroidery combo machine, which means you can do embroidery along with regular sewing. This would be a good choice for those who don’t want to invest separately on a regular machine and an embroidery machine. It comes with 67 built-in sewing stitches including utility, quilting, heirloom,decorative stitches and 10 one-step buttonholes. There are 70 built-in embroidery designs, 5 embroidery fonts and 120 frame pattern combinations for embroidery work. You probably won’t see another sewing machine in the price range with such a combination of sewing and embroidery features. Singer 9960 on the other hand makes up for the embroidery features with a vast variety of sewing features. It comes with a whopping 600 built-in sewing stitches, 5 fonts for monogramming and 13 one-step buttonholes. 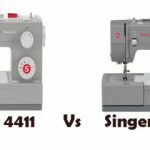 As far as sewing features are concerned, Brother SE400 is no match for this Singer machine. Without any doubt, Singer 9960 is the clear winner here. It will be a great choice for those who want to try their hands on a variety of decorative stitches. USB Connectivity : Brother SE400 has a USB port, allowing you to download unlimited number of embroidery designs from iBroidery.com or other websites. Motor Speed : Singer 9960 has a more powerful motor when compared to SE400. This makes it much more easy to sew thick layers of fabrics. 9960’s motor can deliver 850 stitches/min whereas SE400 can deliver only 710 stitches/min. Sewing Light : 9960 has its nose slightly in front here. It comes with 2 LEDs whereas SE400 comes with a single LED. However the quality of lighting provided is more or less the same. Machine Weight : SE400 is 6 pounds lighter than 9960. One point to keep in mind is that SE400 doesn’t come with a large embroidery area. So a reasonably creative person will soon feel the need for a machine with larger hoop size or one with multi-hooping capability. In that case SINGER Futura XL-400 would be a better option. It is slightly expensive though. Even stevens here, absolutely nothing separates the two. The stitch quality you get on both machines are as good as you get on $1000 industrial machines. That is the reason why people love these machines. That is also the reason why we put these machines in the list of ‘Machines You Can Buy With Your Eyes Shut’. The choice comes down to one thing, whether you want embroidery features of SE400 or you want the variety sewing features of 9960. Other than that, nothing separates these two machines in terms of quality and performance. It is the matter of personal preferences and I have no right to comment on that. It is up to you to decide.